A programmable read only memory is a device that includes both the AND plane and OR-plane within a single IC package. Out of these two arrays AND plane is fixed and OR plane is programmable. Figure below shows the block diagram view of PROM. In the PROM the AND array will act as a decoder which will decode the address lines. The gate level structure of PROM is also shown in figure. In mask PROM it is necessary to specify the bit pattern to be stored according to the requirements of the circuits. Since PROMs are used in logic designs these are also referred as PLDs. 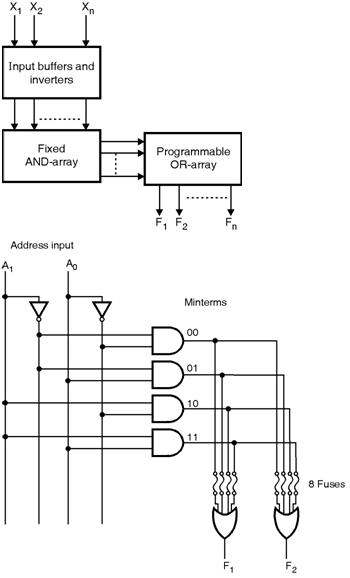 1)	As no minimization of logic circuits is needed the circuits can be designed easily. 2)	It is possible to modify the circuit faster. 3)	These are high speed as compared to discrete SSI/MSI circuits. 4)	The Cost is lower.